These Salem witch trials facts will surprise even the history buffs and prove that these events didn’t happen how you think. The Salem witch trials could be summarized as “women accused of witchcraft, entire colony panics, women then executed.” While that summary is not technically untrue, what actually occurred is somewhat different from the idea that lives on in popular imagination. 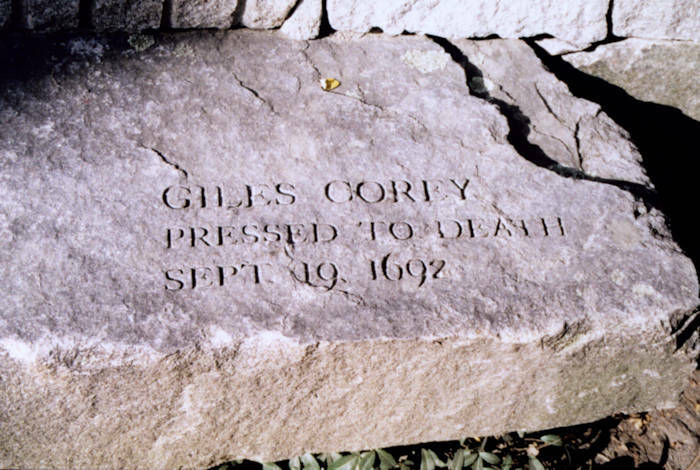 FlickrMemorial to Giles Corey, one of the male “witches” executed during the trials. You’d be hard-pressed to name a famous male witch (Gandalf, Harry, Merlin, and other magical men are generally referred to as wizards), so it may come as a surprise to learn that some of the accused witches in Salem were actually men. A total of six men were accused during the trials. Thanks to Arthur Miller’s famous play The Crucible, John Proctor is probably the best-known of these unfortunate fellows, who also include deputy constable John Willard — who suddenly found himself the object of accusations after expressing doubt as to the truthfulness of the claims made by the accused’s victims — and Giles Corey. Corey refused to enter a plea (since he would have to cede his estate to the government if convicted), so the court had him crushed to death beneath heavy stones. Although this might be the most gruesome fate met by any of the accused, Corey’s stubbornness (along with colonial respect for property laws) ensured his estate was passed down to the rightful heirs. 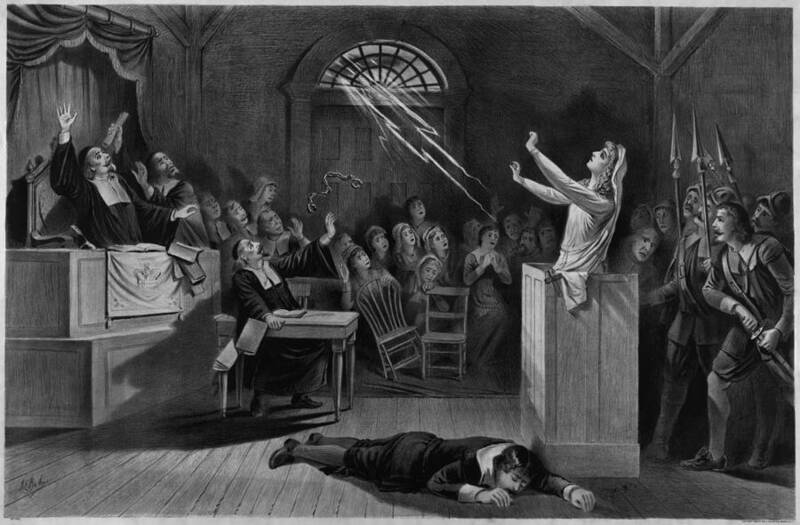 Wikimedia CommonsAn 1876 engraving depicting the Salem witch trials. 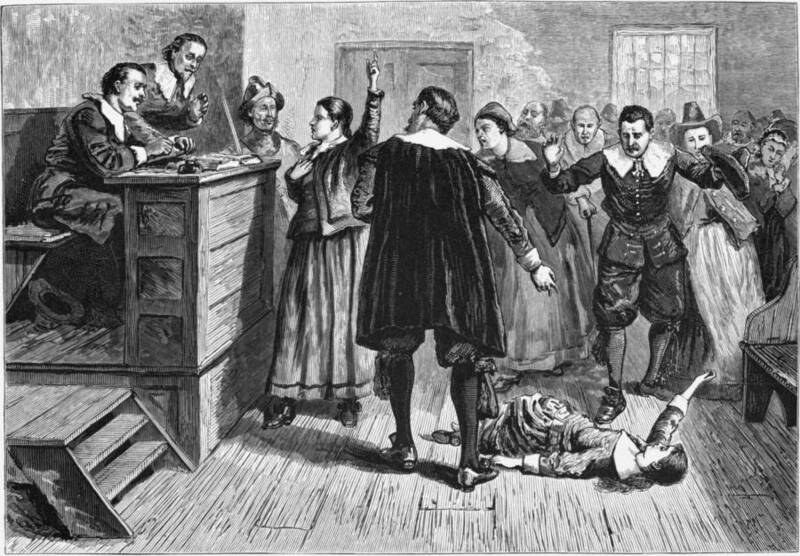 The best-known Salem witch trials facts involve the victims: those who were accused and, ultimately, executed. Because people are most familiar with the tales of the executed, it is easy to conclude that all of the people caught up in the infamous witch hunt tragically lost their lives. However, the actual percentage of the accused who were killed was much smaller than is widely assumed. Naturally, every death was a tragedy because every victim was innocent of the stated crime. However, out of a total of 200 people accused, only between 140-150 were arrested. Out of this group, 20 would be actually executed; the rest were never indicted, managed to escape, or were pardoned. 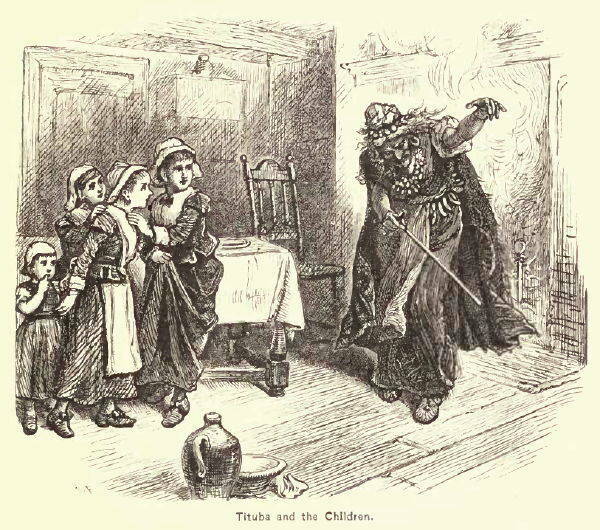 Wikimedia Commons1878 depiction of the slave Tituba with the children who later accused her of witchcraft. It can be safely assumed that none of the people accused of witchcraft in Salem actually attacked innocent children with the help of supernatural forces. Yet, interestingly, not all of the so-called witches denied these accusations. What caused Tituba to confess will never be known; theories range from coercion by the minister to plain deception in order to save herself from the noose (because she confessed, her case never went to trial). Her confession, however, was what convinced the colonists that witchcraft was indeed afoot in Salem and that there was truth to the accusers’ claims. All of the four other “witches” who also pled guilty survived the trials and were eventually pardoned, so perhaps it was simply less risky to confess. Popular depictions of the Salem witch trials generally pit the helpless accused against an entire colony of superstitious pilgrims. The reality is that many Massachusetts colonists remained far from convinced of the guilt of the supposed witches. John Willard (the unfortunate deputy constable mentioned above) made the mistake of voicing his own doubts, only to himself be accused of supernatural crimes. In addition to expressing misgivings during the trials, colonists began to officially express some guilt almost immediately in the aftermath. In 1702, barely a decade after the last victim was accused, the trials were declared “unlawful” and in 1711, Massachusetts passed a bill that officially cleared the names of all of the named witches. 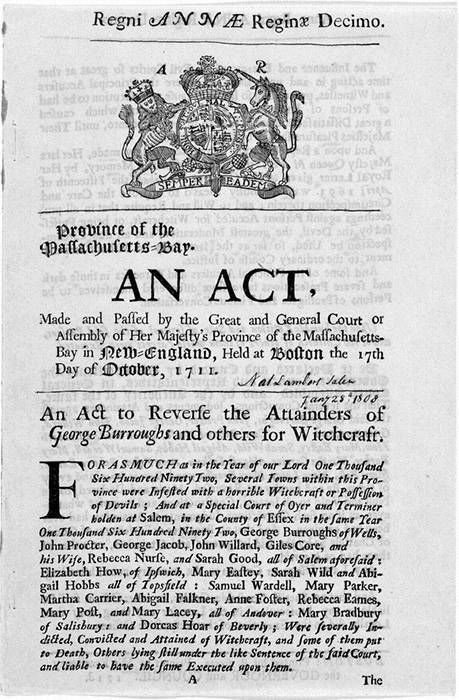 Surviving victims and their families also received financial restitution in 1712, although the state did not issue a formal apology until 1957. Wikimedia CommonsWonder of the Invisible World, Cotton Mather’s famous account of the trials. “Hysteria” is a word often heard in conjunction with the Salem witch trials while the phrase “witch hunt” itself evokes images of an angry mob chasing down innocent people. However, it must be remembered that the Salem witch trials were, after all, trials. It is a testament to the power of the rule of law that the colonists brought over with them from England that, despite the panic and very real fear of the supernatural, the residents of Salem still tried their accused witches in a court of law. 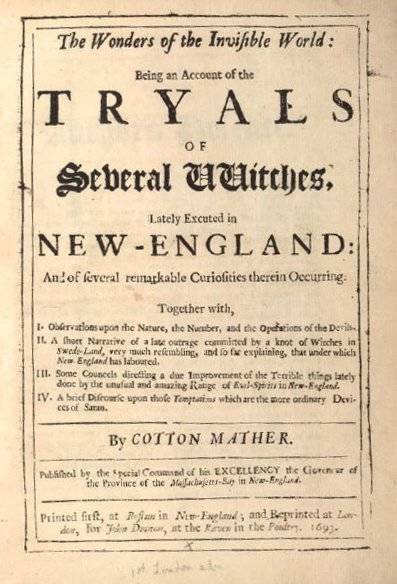 In 1693 (partially in response to the Mathers), the governor of Massachusetts finally prohibited further arrests and moved the trials to a higher court that did not permit spectral evidence, which resulted in the remaining witches being found innocent and effectively ended the Salem witch trials. After this look at Salem witch trials facts that dispel the myths, read up on the history of witches. Then, have a look at some of the most common history myths that most people believe.